The balance between sweet and salty in a grilled cheese. The juxtaposition between gooey and crispy. 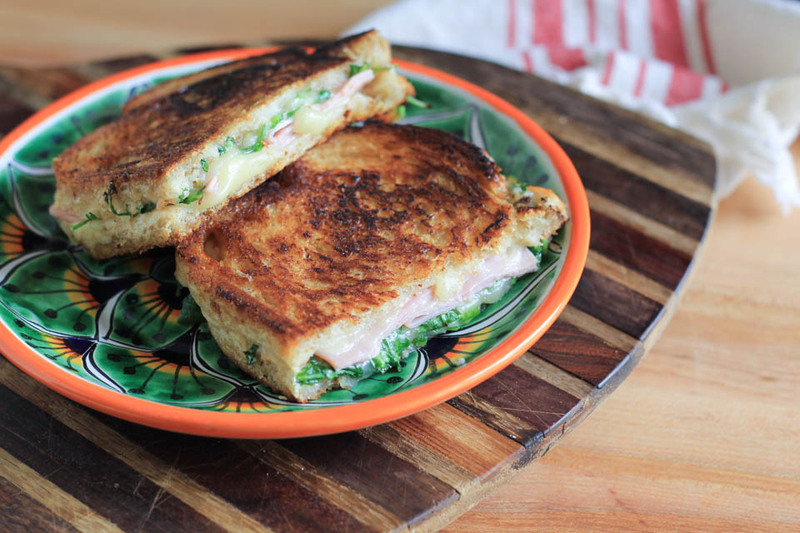 Fresh and savory, all of these are my idea of the perfect grilled cheese sandwich. This isn’t the classic yellow cheese on old school bread, which I am equally poetical about that situation. This is upping the game on a date night at home. We were craving something comforting and wanting something more indulging than a salad. While I did add greens by using arugula, it added a fresh peppery bite which I am always down with, this is no salad. I read something recently about what I used to call “cheat day” and it struck a cord with me. I have called the day I eat a decadent dessert or something I’ve been craving but might not fall under super nutritional, for many years. I eat pretty well most of the time, but like you’ve seen in my bio, my idea of balance comes in line with my life philosophy. I eat whole foods, fish, tons of vegetables, green smoothies, lean meats, grains, fruits, nuts, and so on. I also eat rib eyes, nachos, burgers and fries, BBQ, mac n cheese, ice cream, cake, and so on. I do, however, eat those in major moderation, that “cheat day” I mentioned. It comes about once a week and I enjoy it as much as I enjoy that way I eat on a regular basis. I love all of these foods and I never feel deprived because I actually enjoy eating “healthy”. Back to this article, I read instead of calling something a “cheat day” implying you were “bad”, we could call it “indulging”. It connected with me so very much, a clarity of sorts. The way I think of it, putting something like that on ourselves, like we’ve cheated or been “bad” does nothing good for us. I believe subconsciously it makes us feel bad about ourselves. How is that supposed to make us feel or encourage us to do well for ourselves? Now, I know different things work differently for us all, but I am on the side of things that the nicer I am to myself, the better I do for myself. With that knowledge of myself and what I respond to, that statement worked for me, and since I read that article I change the saying to indulging for me and my brain. It really has worked out for me. I don’t feel “bad” or like I “cheated on anything when I eat somthing like this amazing and tasty sandwhch. I simply know the next day will be like any other day, filled with colorful vegetables and green smoothies, balance. 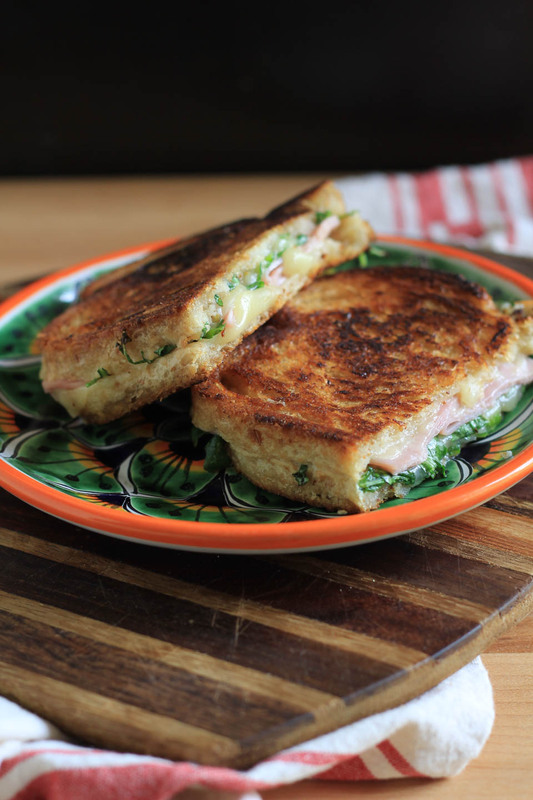 So, I am calling this a flavorful, beautiful, indulging Pepper Jack Ham and Fig Grilled Cheese Sandwich, love in every bite! Spread butter evenly on one side of each slice of bread. Divide and spread fig jam on one side slice of bread, opposite of butter. 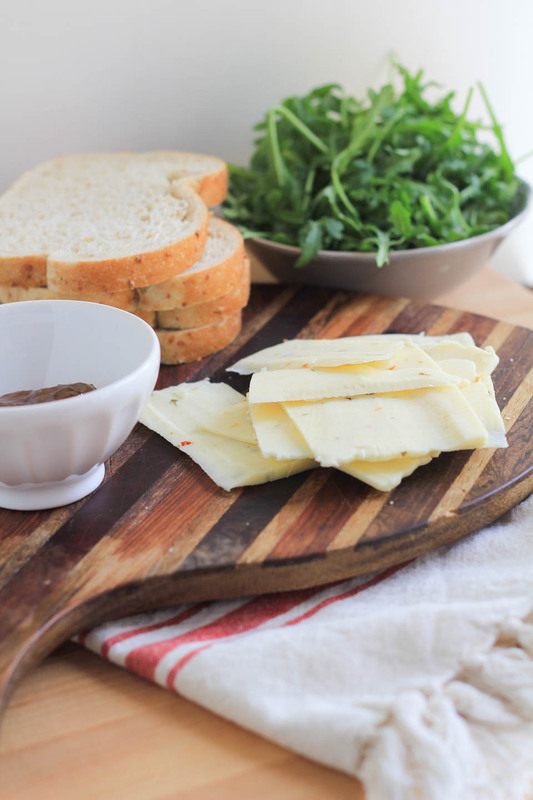 Add sliced cheese on one side on top of fig jam, place ham over cheese, add arugula over ham, add other half of sliced cheese on arugula to keep it from falling out, top with sliced bread, butter facing out. Place large skillet over medium high heat with 1 tablespoon butter. Once butter is melted and hot, place sandwich in the pan, using a spatula, press down on the sandwich to brown evenly on that side. Cook for 3 minutes pressing down one more time. Flip sandwich, press down, cook for 3 minutes. Taking care to melt the cheese, brown evenly, and crisp bread. Remove and place on a wire rack over a plate to keep bread crispy. Repeat with other sandwich. Serve immediately. Not ideal for leftovers. Wow, I had never thought of the negative connotations of calling something a “cheat day”; thinking about it now it doesn kind of make me feel bad. I have this guilt from being “bad” for one day… But really I shouldn’t. Having one day where I have a dessert is not bad! Thanks for this and this grilled cheese looks awesome! Right?!!! Guilt and feeling bad have no place in our lives, it’s simply making a different and more loving choice next time :). Now, that is what works for me anyhow. And thank you!! 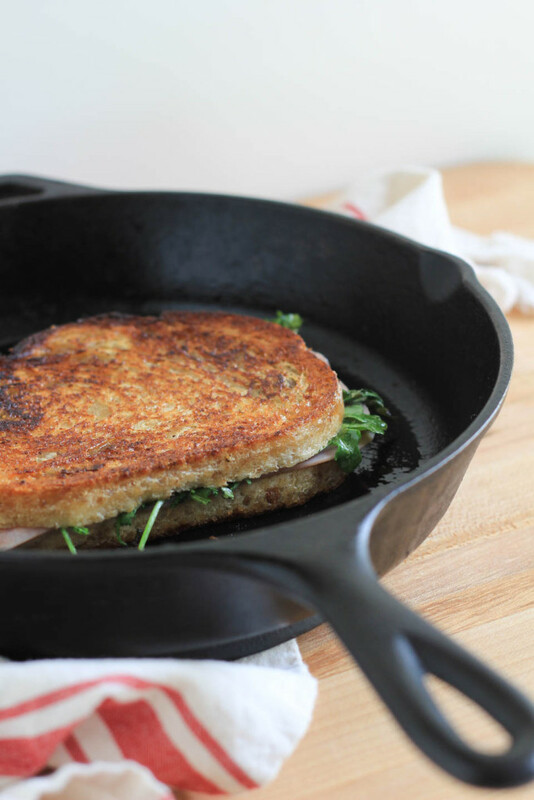 I love adding arugula to grilled cheese sandwiches. The pepper bite really balances the rich cheese nicely. Have a great weekend! I am totally with you and all for indulging and balance! I regularly eat healthy and great foods but sometimes I just want a big bag of chips and that’s ok. Love the addition of fig jam here!